Unique test kit for sperm DNA assessment in human sperm samples. Quick and easy to use. Developed based on Sperm Chromatin Dispersion (SCD) technology. This technology give rise to 2 different morphlogies in the spermatozoa depending on the presence of absence of haloes of chromatin dispersion which is high correlated with the level of DNA fragmentation. It also offer stability to assess DNA fragmentation using conventional and fluorescence microscopy. 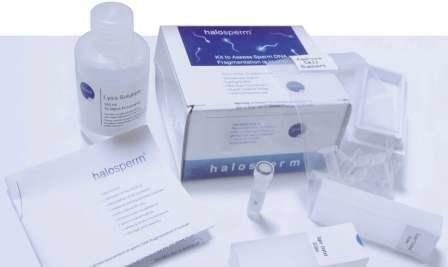 Halosperm DNA Defragmentation Test Kit.